Gdańsk is a place where it is impossible to get bored. With its direct access to the sea, the ccity offers a number of water attractions that are worth using. Especially in the summer. We can go for a beautiful cruise in the Gulf of Gdańsk and admire the site of the Gdańsk Shipyard. We can also feel like a pirate for a moment boarding the Leo Galleon. 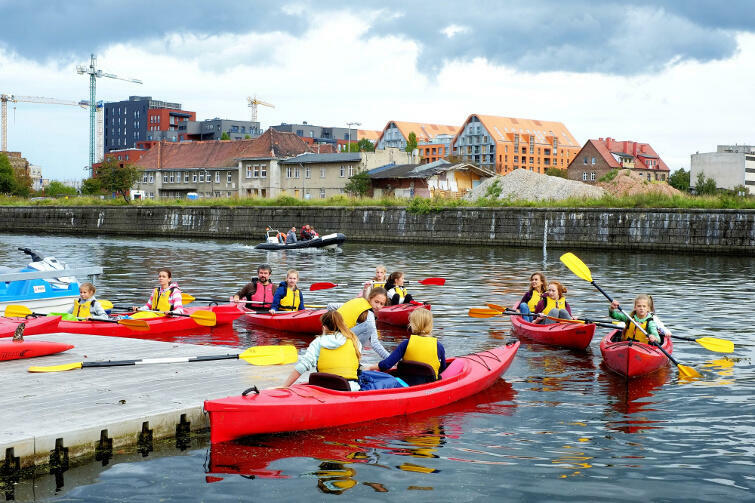 Kayak lovers will sure be interested in visiting Gdańsk from a somewhat different perspective. Are you an angling enthusiast? Face the Cod and feel a touch of adrenaline. It is enough to go to the Hel Peninsula and take a cutter cruise out to the sea to search for a real sea wolf. We can also find something for lovers of extreme sports. We have an offer for everyone. It is worth studying our proposals. All kayak lovers are invited to 15, Żabi Kruk Street. At that place you can rent a kayak to visit Gdańsk from a slightly different perspective. You may follow one of several routes. The difficulty level is suited to the tourists’ skills – you can choose a track dedicated to beginning or advanced kayakers. You can for instance follow the Motława around the Granary Island. On the one-hour long trip you can see Długie Pobrzeże with water gates, the Crane, Gdańsk Marina, Stągiewna Gate and MS Sołdek (Słodek Ship-Museum). That is quite much  Lots of places to take photos. The route is covered within about 1-1.5 h. As long as a Sunday walk. You can also take the route by the Old Motława and New Motława. On the trip you will see the beauty of architecture of the past ages. Additionally, you can admire the shipyards and the port. The time to cover the route is about 2 – 2.5 h.